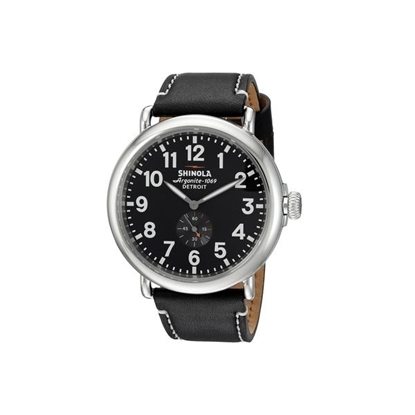 The Canfield is Shinola's watch built using a top-loaded case construction, a technique which provides a sophisticated open-dial viewing area showcasing a refined minute track and slim, diamond-cut hands. Other distinguishing characteristics include coin edge detail on the case and wire lugs. 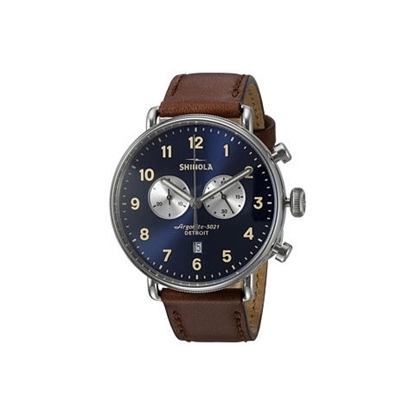 The Canfield Chrono is Shinola’s first chronograph watch built using a top-loaded case construction, a technique which provides a sophisticated open-dial viewing area showcasing a refined minute track and slim, diamond-cut hands. The Canfield Chrono comes equipped with a stopwatch function, signature coin edge detail on the case, and wire lugs. 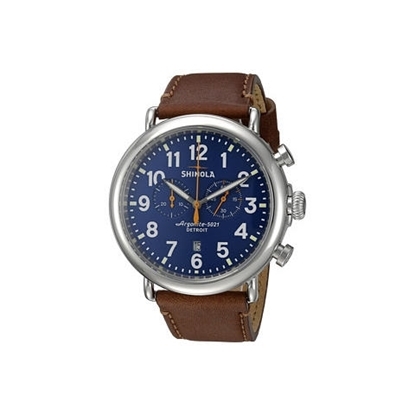 The Canfield Chrono Watch is Shinola’s first chronograph watch built using a top-loaded case construction, a technique which provides a sophisticated open-dial viewing area showcasing a refined minute track and slim, diamond-cut hands. The Canfield Chrono comes equipped with a stopwatch function, signature coin edge detail on the case, and wire lugs. Features of The Runwell include a sapphire crystal, Super-LumiNova® printed dial details and a solid stainless-steel case with screw-down crown. 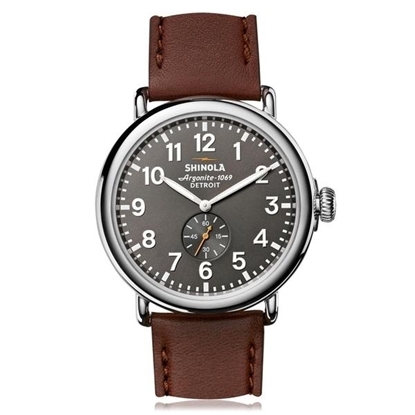 Two hands and remote second-hand sweep are driven by Shinola's Argonite 1069 high-accuracy quartz movement. From the laser-etched case back to the etched lightning bolt on the buckle, every detail of The Runwell has been engineered with an obsessive focus to ensure the highest possible quality. The Runwell Blue Chrono Watch is the only chronograph watch that tracks the return of American industry with split-second precision. Driven by an Argonite 5021 high-accuracy quartz movement that propels the hours, minutes, date indicator, stopwatch function, and multiple subdials. Features of The Runwell include a sapphire crystal, Super-LumiNova printed dial details and a solid stainless steel case with screw-down crown. 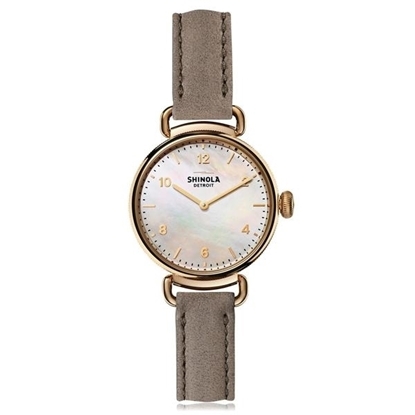 Two hands and remote second-hand sweep are driven by Shinola's Argonite 1069 high-accuracy quartz movement. From the laser-etched case back to the etched lightning bolt on the buckle, every detail of The Runwell has been engineered with an obsessive focus to ensure the highest possible quality. Case dimensions: 41mm dia. This men's watch features a stainless-steel case with grey dial, Arabic numerals and luminescent minute and hour hands, sapphire crystal, Argonite 1069 high-accuracy quartz movement, and a seconds subdial at 6 o'clock. 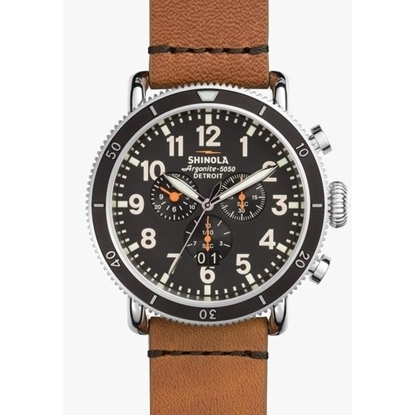 A premium brown leather strap completes the look and ensures the watch stays comfortably secured to your wrist. Features of The Runwell include a sapphire crystal, Super-LumiNova® printed dial details and a solid stainless steel case with screw-down crown. 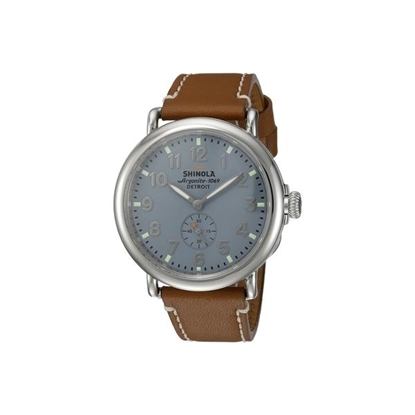 Two hands and remote second-hand sweep are driven by Shinola's Argonite 1069 high-accuracy quartz movement. From the laser-etched case back to the etched lightning bolt on the buckle, every detail of The Runwell has been engineered with an obsessive focus to ensure the highest possible quality. 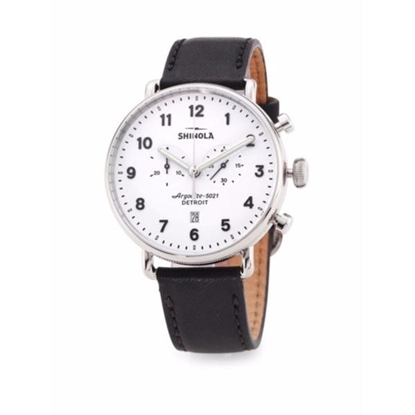 For all around, classic American style with an athletic vibe, wear this men's Shinola watch from the Runwell collection. The 48mm stainless steel case boasts a black dial with Arabic numerals and luminescent minute and hour hands protected by sapphire crystal. Orange accents on the subdials add subtle contrasting color details. Setting this watch a step above the rest is the coin edge bezel that creates an added element of interest to the timekeeper. Powered by the reliable Argonite 5050 high-accuracy quartz movement, this timepiece is fine-tuned to help you keep your most important appointments. A tan leather strap completes the look and ensures the watch stays comfortably secured to your wrist. 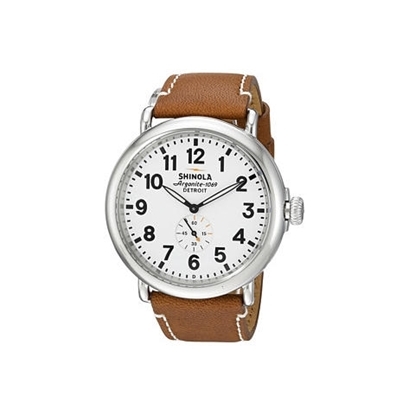 This classic design from Shinola is a must-have addition to any watch collection. The delicate gold-plated stainless steel case boasts a white mother-of-pearl dial with gold-tone Arabic numerals and luminescent minute and hour hands protected by a double-curve sapphire crystal. 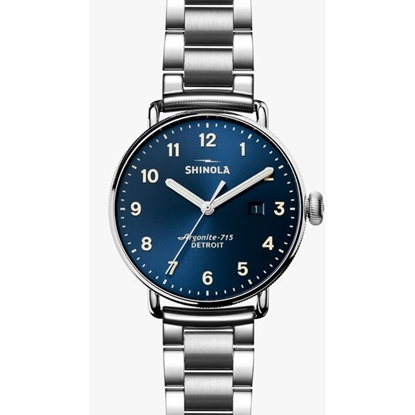 The coin edge around the bezel sets this Shinola watch a step above the rest. Showcasing a refined minute track, the open-dial view is a uniquely functional characteristic. Powered by the reliable Argonite 772.2 quartz movement, this timepiece is fine-tuned to help you keep your most important appointments. A premium heather grey leather strap completes the look and ensures the watch stays comfortably secured to your wrist. Case dimensions: 32mm dia.